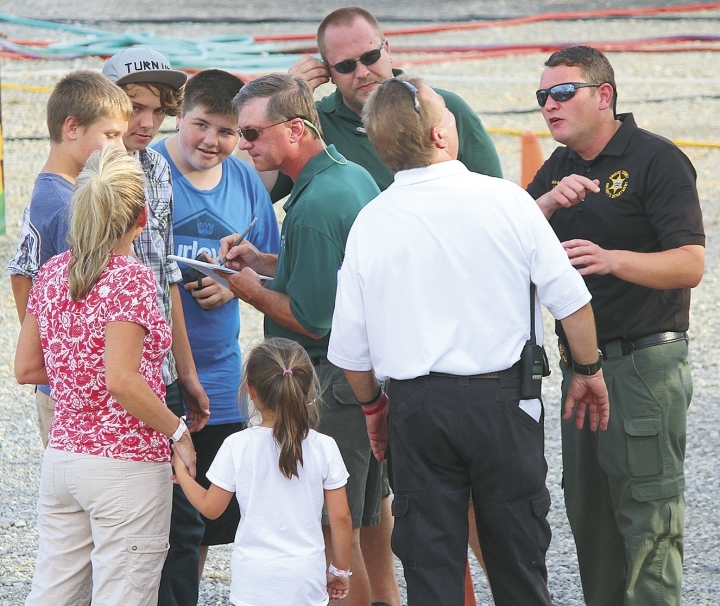 NASHVILLE, Tenn. — The organizers of the eastern Tennessee fair where three girls fell from a Ferris wheel kept their ride operator despite an incident across the state line that injured five and caused the owners' son to be jailed. Private inspectors believe a mechanical failure likely caused the gondola to flip over Monday, sending three girls plummeting 30 to 45 feet to the ground. A 6-year-old girl, Briley Rae Reynolds, suffered a traumatic brain injury in the fall and her 10-year-old sister, Kayla, broke her arm. Their mother, Kimmee Reynolds, posted a statement Wednesday on Facebook that said both girls remained hospitalized. She wrote that though Briley cannot breathe on her own, she has seemed to respond to relatives' voices and the family, taking it "one minute at a time." "Now it's a waiting game," she wrote. "They want to give her more time, and as much as I want her alert and dancing and being feisty, I want her to rest and feel better." Reynolds confirmed the information posted on Facebook to The Associated Press. She wrote that Kayla is able to play and paint despite a heavy cast on her arm and fear for her sister. She called her "my optimistic little sunshine." A third girl injured has not been identified. The Greeneville Sun reported that the 16-year-old was admitted to the hospital in critical condition but has improved to stable condition. 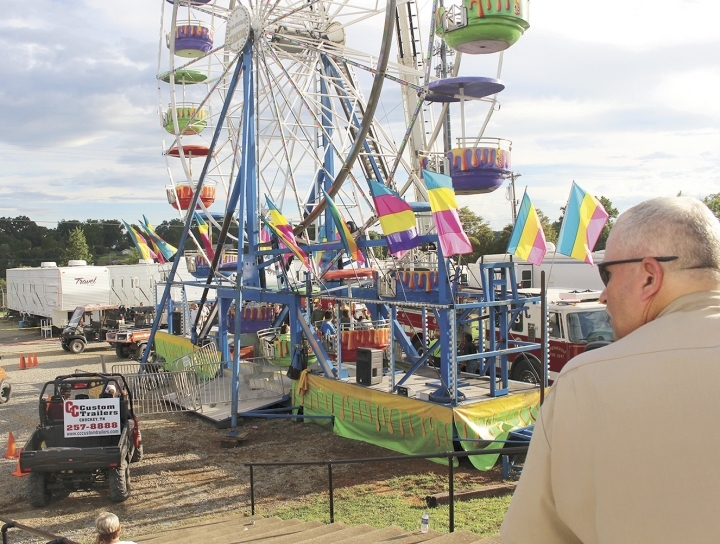 Several inspectors — one hired by the ride's operator and another by the Green County Fair Board — are meanwhile at the fairgrounds trying to determine how the Ferris wheel malfunctioned, Greeneville Police Detective Capt. Tim Davis said. Two federal investigators with the Consumer Product Safety Commission are also on scene, confirmed Patty Davis, the agency's press secretary. "We all want to know why this terrible accident happened," she said, "and what we can do to prevent it from happening again." The ride was operated by a Georgia-based company called Family Attractions Amusement, which was involved in another high-profile carnival accident three years ago. At the North Carolina State Fair in October 2013, five people were injured when an Italian-made ride called the Vortex unexpectedly restarted as they were trying to get off the ride, flinging them through the air and down to the steel deck below. Instigators determined that a safety mechanism had been disabled by ride operators. Attorneys for Family Attraction Amusement owners Dominic and Ruby Macaroni tried to claim that company did not own the ride operated by their son, Joshua. But North Carolina regulators determined that the ride was insured by Family Attractions Amusement, its workers were also employed by the company and the business was listed as the owner at other fairs across the country. The company did not return a message left on the voicemail of the phone number listed on its last inspection report. Joshua Macaroni and ride operator Timothy Tutterrow were each charged with assault with a deadly weapon inflicting serious injury. Tutterrow pleaded guilty and agreed to testify at trial that Macaroni had tampered with the ride's circuit panel to bypass safety switches. Macaroni earlier this year entered an Alford plea — a concession that there is sufficient evidence for a conviction without admitting guilt — on a felony charge of obstruction of justice. Macaroni was sentenced in February to five to 15 months in prison, though the judge suspended that to a month in jail. He was also ordered pay a $22,500 fine. The Greeneville Sun has reported that Greene County Fair Board officials decided to go through with a five-year contract with a Family Attractions despite the North Carolina incident, citing the company's previous safety record in Tennessee and the owners' claims that they were not involved with the Vortex ride. "They seem to be very honest in their dealings with the fair and the people who work with them here, locally," Holt told the newspaper last year. "We expect for them to be here and put on a good carnival act for the week of our fair." Their rides were not inspected when they arrived in Tennessee. Family Attractions received its permit to operate the Ferris wheel in Tennessee for the next three months based on a June inspection in Indiana, according to state Department of Labor and Workforce Development spokeswoman Jennifer Farrar. Because of this accident, the operators will have to have a new third-party inspection conducted before the ride can qualify for a new annual permit in Tennessee, Farrar said. Police and investigators could not estimate Wednesday how long it might take to determine what caused the Ferris wheel to drop the girls. Kimmee Reynolds said she would like some answers. "I know some things need to change," she wrote. "I know that we have a long road ahead of us." Galofaro reported from Louisville, Kentucky.